Tonight after work I went to the Total Health Show at the Toronto Convention Centre and it was awesome! The show is now in it's 32nd year and this year's show is filled with interesting lectures, panels, demos and exhibitors promoting a healthy natural lifestyle. I did some research of some of the exhibitors before I went, so there were some booths I knew I needed to stop at! One of the first was the Vita Mix booth (I know you're all thinking that I should just buy one already!). It was great to see the blender in action! I was hoping for an exciting special offer but was disappointed when they price of $579 + tax was finally disclosed. Sadly, I did not leave with a blender. Luckily I made up for my blender-free shopping bag with lots of other goodies! 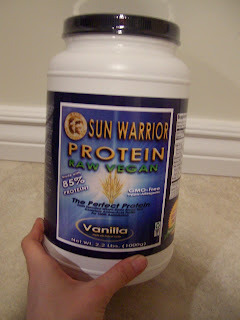 I found some Sun Warrior protein powder at Upaya Naturals. VeggieGirl has been singing the praises of this protein and I was really interested. I will let you know what I think! I also purchased some yacon syrup because I was curious about it after seeing it in a recipe at Elana's Pantry. One thing I noticed at the show was that everyone was incredibly nice and friendly! People were incredibly passionate about their products whether you were willing to buy them or not and I really enjoyed the conversations I had whilst I was wandering around. 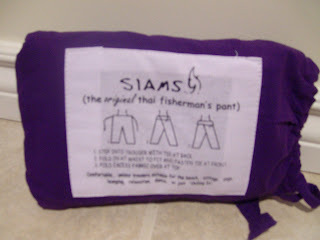 I found a pair of super comfy pants at the Siams booth. Alli was so sweet and happy to talk about how comfy the product was and was kind enough to give me a demo on how to wear them. I tried on a pair under my dress and I was sold! The most challenging part was choosing a colour. I went with purple because it really caught my eye and Alli said they looked good. These will be awesome for yoga or dance class or the beach or just lazing around! 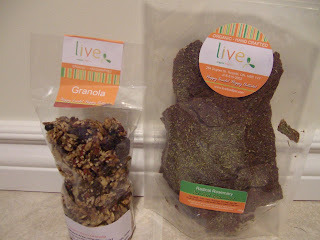 The wonderful folks at Live had a booth where I picked up some granola and chips. I'm excited for a new breakfast option and something new to dip. 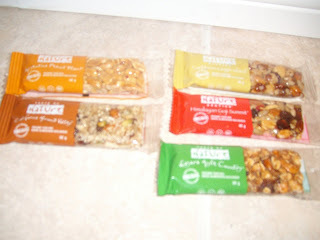 I also picked up a bunch of bars to try from Taste of Nature. I tried a sample at the show and was just snacking on one and I really like them! They are certified organic, vegan, Kosher and made with natural ingredients. The bar I just had was Caribbean Ginger Island, which is part of the Exotics collection. It had a great flavor, wasn't too sweet and I LOVED the little bits of ginger. I will definitely get this bar again and I'm looking forward to trying the other flavors. The highlight of the show for me was Julie Daniluk's talk on Meals that Heal Inflammation. 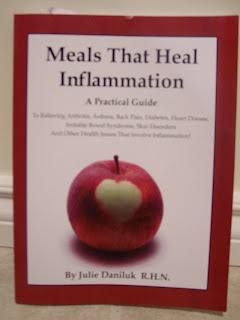 Since Crohn's is part of the inflammatory bowel disease family, inflammation is one of my big concerns and Julie's book was definitely of interest to me. I had seen it a couple times at The Big Carrot, but had never purchased it for whatever reason. Her talk was great. It was a small, but attentive group and Julie focused on some of the main points in her book (Meals that Heal Inflammation) including the six main causes of inflammation (toxicity, infection, allergy, nutritional deficiency or excess, injury or emotional trauma) and three big things we can each do to help heal including getting in your omega 3's, removing white sugar and white flour from your diet and eating your veggies. Julie's passion for nutrition and learning really shone in the talk and I think her guiding principles for those with inflammatory conditions make a lot of sense. I love that her book embraces the fact that one diet will not work for everyone, even if they are suffering from the same condition. Very cool! Check out Meals That Heal Inflammation on her website or at The Big Carrot and be sure to watch for a review in the weeks ahead. I had such a great night at the show and am looking forward to trying out all my goodies over the next couple of weeks. I also visited the booth for some nutrition schools in Toronto and plan to attend their open houses in May. Things could be changing for me and I'm incredibly excited!! There are a lot of great exhibits and tonnes of interesting lectures over the weekend so if you're in Toronto be sure to check it out! Tickets start at $10. I agree- the vendors at this show and other health shows are always very friendly!